This week’s Chambersburg, Pa., Public Opinion reports on the first Car, Truck, and Motorcycle Show that was held at the Grace Brethren Church in Chambersburg (John Bayer, pastor). (It was announced in last week’s issue.) A portion of the story appears below. Click here to read the complete article. 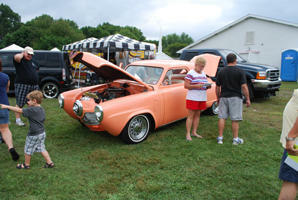 CHAMBERSBURG – Despite the rainy weather on Saturday, more than 60 vehicles showed up to compete for the first Car, Truck and Motorcycle Show at Grace Brethren Church to raise money to buy a playground. Pastor John Bayer Jr. said the show was to help honor his parents, who were not only passionate about cars, but were active in children’s ministry. The organizations that will benefit from the playground are Peach Tree Kids Preschool, a program of United Cerebral Palsy that puts disabled children with able-bodied children to promote connections; Child Evangelism Fellowship, a Waynesboro program that hosts Bible release time for elementary students at the church; and Camp Joy El, a Greencastle organization that also offers Bible release time at the church. Bayer said the playground will not just be a “church thing” but that he hopes that the ministries and organizations that use the church will be able to use them. The community has been helping tremendously, he said, and has seen the amounts of giving – big and small – even before the show began. “A 12-year-old at his congregation who just began working just donated $30 to help,” Bayer said. He also mentioned some children that are collecting change. “This church community has been helping as much as they can,” Bayer said.